Customers need a compatible app like NearBee or a brand app by the restaurant or bar. Once in the proximity of a beacon, these smartphones receive push notifications about deals, offers and more. You can now build your own app without any coding with our DIY app builder platform in partnership with Shoutem. 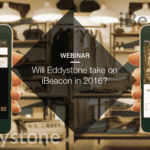 Here’s how you can use Beaconstac to create a powerful beacon campaign for a restaurant. Got an inspiration for your restaurant marketing strategy? Planning a beacon pilot? Take a look at Beaconstac, that includes everything you need to get started. Using Beaconstac you can set up your own campaign, without a developer’s help! If you’re a restaurateur, here’s how you can get in touch.